The now-defunct Rex Theatre, recently revived as a cultural space, is hosting a pop-up flower market for the next two weeks. Chinese New Year, a celebration of Spring was the inspiration for REXKL Flower Market 2019, and promises to remind Malaysians of the olden days when people would flock to Petaling Street for festive needs. 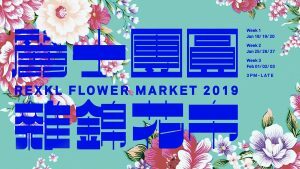 Besides flowers, there will be food, bars, live acts, workshops, lion dances and more. Sweat out the hangover from the night before as Asia’s leading Barre studio, WeBarre Singapore makes its Malaysian debut at WET Deck, W Kuala Lumpur. Plié and arabesque your way to a fitter and more toned body in a fun-fueled workout led by WeBarre founder Anabel Chew, and find out exactly why all the A-Listers swear by it. All you need is your own mat and a comfy change of clothes, see you at the Barre! Dr. K. Azril Ismail, a practitioner of the early arts of 19th Century Photographic Processes took a set of images, taken in 2002-03, and showed them through a series of monographs, black and white exhibitions, presentations, talks and forums. 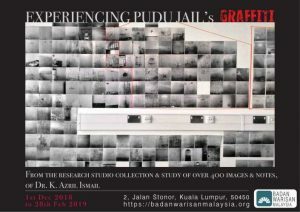 The influence of Pudu Jail’s graffiti are up to personal interpretation, so why don’t you … join in the conversation of decoding this narrative? Could it be seen as art and craft, a reflection cultural norms and practices at that current time, or a cumulative of cultural languages?